ADSS graduates bid adieu to high school with convocation, prom this weekend. Brittany Reynolds and Nolan Badovinac relax before their graduation. Between wrestling, great grades, late French immersion and piano playing, it’s amazing that Alberni District Secondary School 2015 valedictorian Nolan Badovinac has even a moment to sit down and reminisce about it all. “I have my Grade 7 piano certification with the Royal Conservatory of Music,” said Badovinac, who started playing when he was four. He’s also headed to Simon Fraser University in September to study actuarial sciences. It’s a different side to the 17-year-old, who usually makes the news for his wrestling prowess. That prowess on the mat gathers acclaim for good reason—Badovinac is a three-time national champion and recently committed to SFU’s wrestling team. “You have to compete against the best if you want to be the best,” said Badovinac. That’s what Badovinac expects to get at SFU. Unlike other Canadian universities, it’s part of the NCAA and competes against American teams. Competing in both styles gives Badovinac variety and prepares him well for his ultimate goal—the Olympics. It’s during those three years that he’ll get his shot at the Olympics. 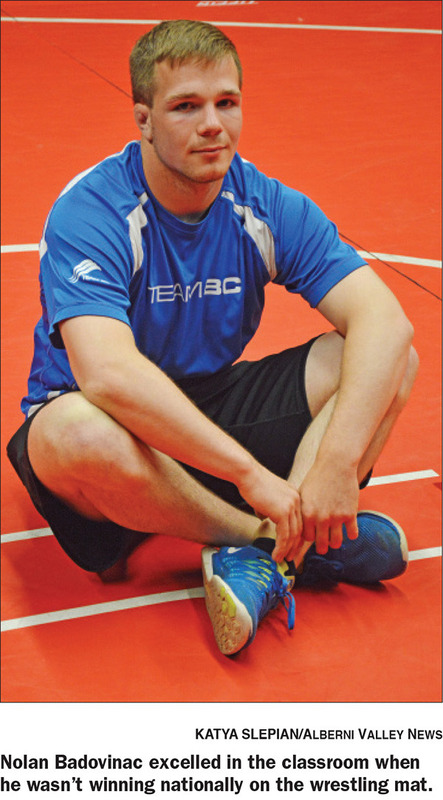 While Badovinac is set to study actuarial sciences at SFU, he’s ready to reconsider his options if the Olympics start to look like a real possibility. The backing behind all Badovinac’s success is a family that has bolstered him every step of the way. “I have a really supportive family,” Badovinac said. Badovinac’s younger brother Aaron is also a wrestler of note at ADSS. Badovinac started playing baseball and then transitioned to wrestling in middle school under the advice of James Messenger­, currently the vice-principal of E.J. Dunn and heavily involved with wrestling in Alberni. He hasn’t stopped wrestling since, no matter what else has been on his plate.